Registration will be held at Saloon No. 10. Registration hours are to be announced. For ticket purchase, please call 800-344-8826. 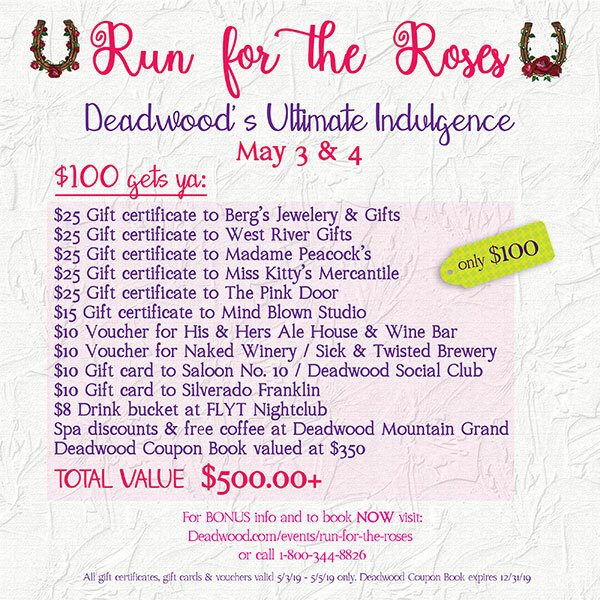 1 Deadwood coupon book – Save up to $350 on purchases! *Kentucky Derby Fun! Hat Contest at Saloon No. 10 – Pick up your hat at registration and create your own design with free hat decorations provided by participating Deadwood store locations! *The Manly Match Up: Send your jockeys to the tru lobby located in Cadillac Jack’s from 1-3pm on Saturday for a Foosball Matchup, beer buckets and cigars from Deadwood Tobacco.